method contract and a sample method specification to demonstrate to your team how these two documents are developed. You decided to use the CourseList and the Course classes for your demonstrations. The CourseList class maintains and populates the current list of courses that the end user is working with while registering for clases. You will demonstrate the contract and the specification of the GetCourseByCourseID() of the CourseList class. The GetCourseByCourseID() method searches the current list of courses for a course whose CourseID matches the ID supplied to the method. If a matched course is found, it is returned by the GetCourseByCourseID() method; otherwise a null value is returned, indicating there are no matching courses. •	Download the CRC Cards for the CourseList and Course classes and review them to prepare for your deliverables this week. •	Download the Method Contract Template and use it for your deliverables this week. •	Create the method contract for the GetCourseByCourseID() method of the CourseList class. •	Explain your work and the decisions you made to arrive at your proposed solution. 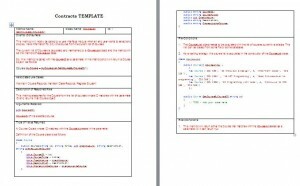 •	Download the Method Specification Template and use it for your deliverables this week. •	Create the method specification for the GetCourseByCourseID() method of the CourseList class. •	Copy and paste all assignments (method contract and method specification) into one Word document. Save your document with the file name CIS339_Lab6_YourName. •	Submit your assignment to the Dropbox located on the silver tab at the top of this page.